If you, or your church, mosque, office, school or business would like to help Edinburgh Direct Aid, please click here to donate cash, or here to see a wish-list of suitable donations in kind, and directions as to where to bring them. Imagine living on grass and seeds for several weeks because there is simply no other food to eat. Imagine not being able to leave your house because the possibility of being shot or executed or tortured or shelled is an ever present and likely possibility. Imagine looking out of your house window if you dare go that close to glass and seeing many dead lying in the streets rotting in the heat of the Iraqi desert temperatures. You don’t know if these dead are your neighbours, your friends, even members of your family. Use of phones has been banned and there is no Internet so you just don’t know who is alive and who is dead. This has been the everyday reality of life under the brutal regime of ISIS since it took the Iraqi city of Mosul in June 2014. Edinburgh Direct Aid is well used to hearing and seeing the ongoing suffering of the Syrian refugee population as we continue our work on the Lebanon/Syrian border now well into our 4th year. We are a small international Scottish based voluntary NGO and sometimes we get requests to help in very difficult places – difficult as a result of natural disaster or difficult as a result of ongoing conflict. So it came about that a request was received some months ago from an organisation in Iraq asking if we could give any help with the overwhelming numbers of people fleeing the city of Mosul as the battle to finally cleanse the city of Islamic State fighters continues. As a result, a few weeks ago, EDA was in Iraq. We based ourselves in Erbil, Northern Iraq. Erbil is the seat of government for Kurdistan, and with the permission of the Peshmerga security forces arranged by the Governate of Erbil, we drove out of the city and took the road to Mosul. We soon left the tall skyscrapers and new buildings behind. The distance to Mosul is around 55 kilometres and the road soon enters a desert like landscape with isolated, small, and rundown looking premises by the side of the road. These buildings become less frequent as we get nearer to Mosul. We passed through the big Peshmerga checkpoint after a thorough search of our vehicle and the handing over of our Government permission documents. We had been assured that the security forces had cleared a safe corridor along this road after Islamic State had planted huge numbers of landmines and Improvised Explosive Devices when they moved in to take Mosul. As we drew nearer the city, we had to cross a number of temporary Bailey bridges. The main bridges had either been destroyed by IS to hinder any advance by the Peshmerga and Iraqi forces or they had been deliberately destroyed to prevent IS moving further East across Kurdistan. At this point we began to see many destroyed villages. Most houses and small businesses had been either completely demolished or very badly damaged. Then we arrived at the first camps. They sit on a vast expanse of stone and sand and utterly flat land. There is no shade of any kind. There’s no trees, no green to break up the dull yellow. The sun beats down on one’s head until the brain feels like it’s frying. We sought refuge at first in a sort of mobile office building used by the camp management staff. This had air conditioning because it was the only structure for miles around that had an electricity supply. However we wanted to go to the tents and meet the families. We could find out what was needed in the camps from the management team but talking to the displaced in their oven – hot tents, gives a better insight into what is really needed and the level of urgency required to address such needs. It also helps to give us a feel for the horrors that these people had endured. Despite our Lebanon experiences, what we saw and heard was still a shock. 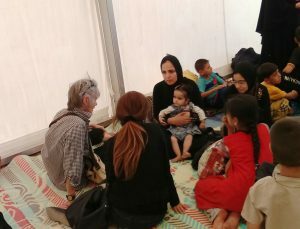 The temperature in these camps was almost unbearable and the summer hadn’t really got going yet – it was around 40 degrees as we sat with a number of families and listened to their terrible stories of survival and escape. It would soon reach 50 as the summer really began to get going. Ahmed and his family of 8 which included his elderly mother, as well as his 3 children and an aged uncle, had walked for 5 hours on a circuitous route to reach the Peshmerga checkpoint where they had been allowed to enter the haven of a bus to await transport to the camp. That morning as the family cowered inside their Mosul house away from any external walls or windows, they heard much noise from the flat roof above them. They thought that IS snipers had taken up positions but an Iraqi army soldier appeared at the top of the stairs and told them a narrow route had been cleared along the street and this was their chance to get out immediately. They had no time to grab very many possessions before fleeing. When I spoke to them in their new tent their relief was palpable. The two older children were quiet, the youngest one, just a baby, busy with his water pistol most likely unaware of what his family had endured. As we sat in the tent with the family a bus arrived into the camp compound. 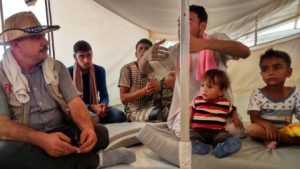 As we watched the doors opened and a line of recent escapees from Mosul began to climb out, some clutching small precious items grabbed in the last seconds of the escape but most carrying small sleeping children They had nothing else except some emergency food rations given to them at the checkpoint. They were quiet and compliant as the soldiers and camp staff directed them to a large registration tent. We sat down with an extended family from this recently arrived group. They were mostly women whilst the men lined up to register their relatives names and give whatever ID documentation they still possessed. One woman, Rabia, told me how horrible the first part of the journey had been from their house to the outskirts of the city. There were many dead in the streets and the escapees had had to walk round them or step over them in order to stay in the narrow security corridor directed by the soldiers who were accompanying them. The children had been traumatised by seeing so many dead – many of the dead were IS fighters but some were ordinary civilians who just hadn’t made it through to safety. She said that the sound of gunfire and shelling had been all round them and at several points they were regretting the decision to leave the shelter of their home. There was also the constant threat of stepping on mines, thousands of which had been scattered around the city streets by IS to deter escape. But they were starving – eating grass and seeds and little else was causing many stomach problems for all of them but particularly the children. Seizing their chance to leave was difficult and very frightening but as a group of families they decided to go for it. Rabia and her family and neighbours made it. It was harrowing listening to these testimonies and they present the same picture of so many conflicts in the Middle East and beyond – ordinary families with quite comfortable lives suddenly immersed in the most terrible and brutal situation for a lengthy period of time. The system that they have known and relied on for most of their lives suddenly gone and in it’s place terror and destruction and death. I feel completely humbled by the resilience and bravery of all those who’ve made it out to this camp, both adults and young ones. We will try to do what we can. What else can we do. Now back in the UK, EDA is working hard on a plan to help where we can. In recent weeks the BBC and other news channels, have been highlighting the plight of hundreds, if not thousands of young children, many of them badly injured, who no longer have parents or family around to look after them. So many of these children have lost their parents and family members, many of whom are buried deep under the innumerable piles of rubble that is more or less all that remains of Mosul city. Many more have been picked off by ISIS snipers as they’ve attempted to flee. What’s to be done with these children? They’re lost, traumatised, alone and confused. The problem is very urgent. As I write this EDA is constructing an insulated prefabricated, transitional children’s centre in the Hosham Sham emergency camp just outside Mosul. The camp is run by the Barzani Foundation, an extremely experienced Kurdish charity with a number of child specialists on their staff. The centre will provide a safe and secure space to sleep as well as a children’s play area and a classroom where the children can be given the routine normality of ‘going to school’. The centre is not large enough to accommodate more than a fraction of the numbers needing its services but with more funding we can easily expand it. Prefabricated buildings are not only mobile but simple to extend. The camp is in the hot desert area around Mosul but the play area is already being turned into a green space – some play equipment has been purchased but we need to buy more. These children represent the next generation in Iraq. We have to try and minimise the damage already done to them. It’s not easy or quick but at least we can make a start. To support Edinburgh Direct Aid, please visit their website.